An emergency happened in the Sea Kingdom! 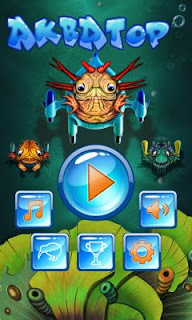 Vicious AquaMonsters want to kidnap all baby fishes to teach them pick their noses and eat with dirty fins! To protect the future of the offsprings, the fish people dispatch brave Aquator to the battle against the aggressors. The hero has the newest scientific development, the combat bathyscaphe, at his disposal. 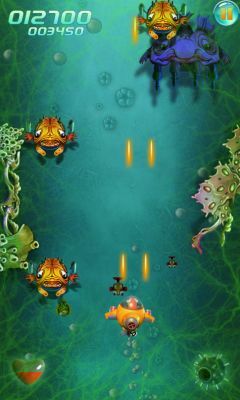 The submarine ship is equipped with a powerful cannon and is steered by turning your device at different angles. A super bomb, two kinds of weapons and mega food to restore vitality were invented especially for the expedition. But treacherous enemies really lost their self-control! This gangs chieftains can shot guns and poison. It is high time we made mincemeat of the bad guys. Dont waste your time! 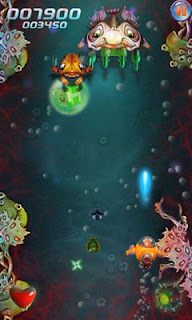 Help Aquator accomplish his mission and send the enemies straight to the moon.